This being my fourth Thanksgiving abroad (wow, time flies), I've got to say that each year I've celebrated a bit differently. One of the worst parts about being an expat are holidays like these being well, just not like real holidays when you have to go to work. 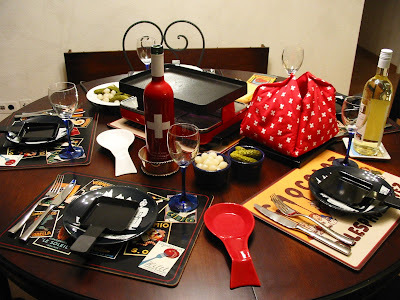 The first year I had friends visiting from the States and the turkey thing was too overwhelming (not to mention too pricey) so we had raclette for Thanksgiving. (You can read about it in my column in this month's Swiss News). Last year we had our Swiss neighbor over for a more proper American-style Thanksgiving. We cooked turkey breasts, cranberries, cornbread, stuffing, sweet potato casserole, pumpkin pie and more. All our neighbor could say in between admiring all of this foreign food, was "it's just like in the movies." This year, I'm celebrating with some American expats in Zurich. We're having a potluck Thanksgiving tonight after everyone gets out of work. How about you? Will you be celebrating? Or just working? Or both? And be sure to check out my guest post today over on Swisstory Blog about what the Swiss think of expats in Switzerland. we had thanksgiving on sunday with a deep fried turkey (courtesy of my inlaws). it tasted good and we had a great time with friends. today we'll be watching the macy's parade. have a great thanksgiving! That sounds good. Enjoy the Macy's parade. Almost forgot about that! Today's just another day, but wait till Saturday - 40 people in our house for a Thanksgiving potluck! Yikes!! Have a good one, Chantal! This year I slept in, will make some spinach/artichoke dip and head over to see my friends. Me too. Raclette is great for Thanksgiving! Celebrating tomorrow all American style, can't friggen wait. It is by far my favorite meal, the one I would request if I were on death row...swear. I think our catered turkey must have cost at least 200 CHF too. Thanks to our hosts!! It was delicious. If you are celebrating Thanksgiving this weekend, enjoy!